Queen Anne stands before us, there must thousands of onlookers here to watch- the young, the old, a mass of people swarm the scaffold where she stands dressed in a robe of dark grey, trimmed with fur and a crimson kirtle. An English hood upon her head, her hair pilled high underneath. The headsman stands off to her side, dressed all in black. Rumor from the crowd has spread that his sword is hiding beneath the golden straw. Her words so fierce, they cut through the mummer of the whispering crowd. A dazed look upon her face, pure exhaustion no doubt from awaiting the long arrival of the French executioner. Within the crowd some quietly snicker, some pray beneath their retched breath. 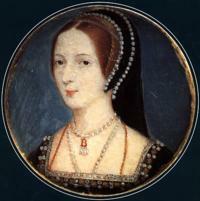 I stare straight on, my eyes fixed upon the Boleyn Queen who had risen so high only to fall so far. Her ladies stand behind her holding back tears, fingers shaking as they nervously await the Queen’s death. Are they tears for the fallen Queen, or fear of living in a Kingdom so cruel and harsh? Could they be next with their heads on the block before the English people? If the Queen of England herself cannot escape the scaffold than who is safe from this miserable fate? I look for fear upon her face, I see none. I listen to her humble words searching for harsh answers, yet I hear none. So beautiful in this hour, so strong even at the end. Respect her or not, this is what makes a queen a true Queen. I lower my eyes, bow my head and pray for the soul that is about to leave this earth. Queen Anne, “The Most Happy” is asking for my dearest prayers, and this is one gift I can give her on this shadowy morning upon Tower Green.